I know I’ve been too busy to post anything here for a while now, but I came across something recently that I found so cool that I had to share it. Usual disclaimer: This is a very handwavey explanation. Most people think of black holes as “a thing that nothing can escape from, not even light”. And this is correct, modulo some quantum stuff. You also may know that general relativity tells us that the gravitational force is actually a warping of space-time itself, and that at the centre of a black hole the spacetime is so curved that it becomes singular. Obviously you’ve spotted the contradiction to Fermat’s last theorem there too, right? 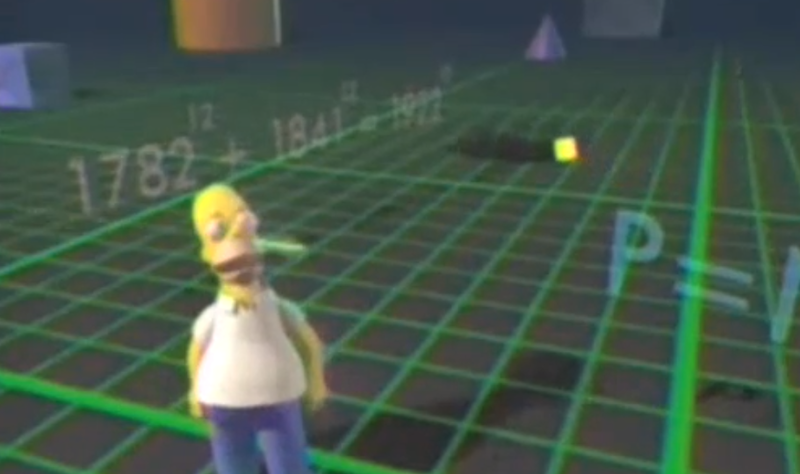 A curvature singularity is thought of like the hole in ground in the above image from Homer’s trip into 3D land; it becomes infinitely curved. It is generally assumed that inside a black hole there is always one of these singularities, and in fact the standard picture of gravitational collapse tells us that this should always be the case. However, some recent work by Prof. Dr. Frans Klinkhamer from the Institute for Theoretical Physics at Karlsruhe Institute of Technology has come up with some unusual solutions to Einstein’s equations corresponding to black holes without singularities. Now this in itself is not entirely new, because people have found similar solutions by inserting some weird “exotic matter” into their models. However Klinkhamer has come up with solutions to Einstein’s equations corresponding to black holes without singularities, without introducing weird matter. In fact, these solutions have NO matter in them; they’re entirely empty universes. There is however something peculiar about his universes, which allows for these black holes. The difference is in what mathematicians call the topology of the universe. Inside the event horizon, the universe twists around itself; not entirely unlike a pretzel. As I mentioned above, this kind of black hole is a perfectly valid solution to Einstein’s equations but it doesn’t agree with the standard picture of gravitational collapse. There is no proposed mechanism for this weird twisting of the universe to occur naturally from the gravitational collapse of a massive object, and in fact there are theorems saying that when gravitational collapse occurs the end result is actually a singularity. But who knows? Perhaps when we have a working theory of quantum gravity, we will come up with a mechanism to avoid the singularity and end up with one of these solutions instead. Or perhaps this is just a mathematical quirk and nothing more? Technically the Hawking radiation isn’t escaping from inside the event horizon, but it’s stealing energy from the black hole in a weird way. Although recently Stephen Hawking proposed (not very formally) that perhaps a little bit of stuff actually can escape a black hole, but this is another quantum thing. That is pretty rad. So what, is the idea that the topology of the spacetime prevents the curvature from growing to infinity? Still yeah they can probably never exist in reality :p. If quantum gravity effects can be used to create them, presumably they would also destroy them, i.e. if the flat spacetime is lower energy, then the twisted topology would just tunnel to the flat topology after a while. I really don’t know exactly why it works actually. I think the idea is that in this picture the curvature never needs to be thought of as going to infinity in the first place though. It’s just something that looks like Schwarzschild (or Reissner-Nordstrom) outside the horizon and can be filled in in a non-singular way still satisfying the Einstein equations. I don’t see any reason why the singular solution would be more favourable from an energy point of view though, the real problem is that GR says gravitational collapse will result in a singularity. So the question would then be to ask if QM would have any effect at the final stage of collapse to avoid a singularity and bend the topology instead. Tunnelling the other way.